Ipswich, as you will no doubt know by now, is the oldest continuously occupied town in England. A conurbation of three known Saxon settlements (and possibly a few others that aren't yet) developed into a town that was among the half dozen largest in England by Domesday, when 10 parish churches were noted. Prosperity came in waves, and by the 12th century, the modern street pattern was more or less laid out, and, in addition to a number of chapels, there were now 15 parish churches. None of these survive today; all were either rebuilt in a further wave of prosperity in the 15th century, or demolished shortly after the Reformation. Several were rebuilt again in the 19th century. However, 12 town centre churches of medieval foundation, all in the Perpendicular style, survive today, as a testimony to the piety and prosperity of those distant days. Some of the churches are very close together. Barely 100 yards separate the churches of St Stephen, St Lawrence and St Mary le Tower, for instance. Several of the parishes were a most unusual shape; St Stephen was actually divided into several distinct parts. Foundations must have been by different people, at different times, and for different reasons; but by the 12th century it became clear in Ipswich, as in other large medieval towns, that the ministry of the churches might best be served by a college of canons. In fact, two Augustinian Priories were established. Holy Trinity, by St Margaret, was roughly where Christchurch Mansion is today; St Peter and St Paul was east of the current church of St Peter. The Priories received their income from land transferred from the churches they served, which was either sublet for rent, or used for growing produce for sale. In addition, the town had a number of chantry priests working in the parish churches and chapels, and possibly attached to one of the two Priories. No trace of either Priory survives today, although the building that houses an estate agent on the corner of Soane Street is part of the former hostel of Holy Trinity. Arcade seats in the Friar's chapter house. The high altar of the church was where the lamp post is on the extreme left. The rubble wall in the foreground is the superstructure of an altar that stood in the nave, to the south of the chancel arch. Only three stone altar superstructures survive in the whole of Suffolk; the others are at Orford Castle and Bury Abbey. By the 13th century, other organisations were beginning to serve other needy ministries of the Church. Most predominant were the orders of Friars, who were preachers, teachers and evangelists. Three orders of Friars had communities in Ipswich. In 1278 the Carmelites, or Whitefriars, arrived. They were a very learned order, spending their time studying and lecturing, much in the manner of a modern university.They had their Friary roughly where the Buttermarket Shopping Centre stands today. During the course of the 14th century, it expanded rapidly, and stretched all the way from Queen Street to St Stephen's Lane. It was the biggest foundation in Ipswich, and one of the largest Carmelite communities in England. No trace of it survives. The Franciscans, or Greyfriars, were missionaries and itinerant preachers, and in 1298 established a base house near where the tower block of St Francis House stands today, just to the west of St Nicholas. They were particularly popular with the ordinary people, for their work often involved helping the poor. Ironically, the house would later be used by Presbyterians expelled from the Ipswich parish churches in the 1660s, before they established their own church in what would become the Unitarian Chapel across the road. The Friary was demolished in the 18th century, but some surviving stones forming an arch are set in the wall by St Clare House just to the west. As well as giving their name to a tower block, they are also remembered in the name of the Greyfriars Complex, one of post-war Britain's largest and ugliest urban renewal schemes, which went up in the late 1960s, but is now largely demolished. The only substantial remains of a medieval community's foundation in Ipswich are those of the church of the Dominicans, the Blackfriars, whose Friary of the Blessed Virgin lay to the south of Tacket Street. Standing in the west doorway of the church, looking east. A nave altar stands in front of the nearest lamp post. To the left of it is the chancel step, and the resonance chambers of the choir. To the right of it is the arcade of the chapter house wall. The high altar stood where the far lamp post is. All this is now a public recreation area. The Blackfriars had been founded by St Dominic, 47 years earlier, and were intended as an order of preachers, who tried to live 'the apostolic life' in community with each other. St Dominic taught that those who took a vow of poverty were freed from the care of property to travel and to preach, as described in the Gospels and the Act of the Apostles. The Blackfriars community was the first of the three Friaries to be established, in 1263. It expanded rapidly; within 15 years, there were 50 members, out of 20,000 worldwide, a number that would not be reduced until the Black Death in the late 1340s. It gradually took over the fallow land that lay to the south and east, including part of the town wall and ditch, and new buildings were erected. Unlike the Priories, the Friars were not allowed to own land beyond their immediate premises. Instead, they relied on charitable donations for their upkeep. This might have been their salvation; but it proved to be their downfall, as we shall see. Their church was dedicated to Mary. It had substantial aisles to north and south, and a choir separated nave and chancel, in the cathedral manner. There was probably a central tower, and early reports of a spired church seem to refer to this one. The chancel had a chapel to the south, probaby constructed after a bequest by the Dukes of Suffolk. Between this chapel and the nave were the chapter house and the sacristy. In 1528, the Priory of St Peter and St Paul was suppressed, to free up land and assets for Wolsey's ill-fated Cardinal College. The other Priory, Holy Trinity, fell victim to the dissolution of the monasteries in February 1537, and its assets were stripped to line the coffers of the treasury; they were ultimately squandered on high living at the Royal Court, and the incompetent and expensive Siege of Boulogne. Dunno who this bloke is, but one of Suffolk's three surviving stone altar superstructures stands behind him. We are standing in the choir, with the chancel behind us, looking south west towards the south aisle. Note the outline of the church wall, covered by buildings for 450 years. The Friaries, of course, had little in the way of land, and were not such a priority for asset stripping. However, the State was particularly wary of preaching orders, who could not be relied upon to toe the new line. 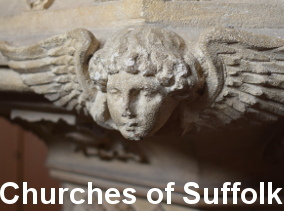 Only one in five Parish Priests in Suffolk had been considered trustworthy enough to be licenced to preach by the ruling Protestant reformers; the Friars were certainly not to be accorded this privilege. They were left to wither on the vine. Unfortunately for the Government, the Friars began to sell their possessions in order to survive. The Treasury soon realised that there would be nothing left for them to sequester, and so in November 1538 the Friaries were closed, their assets also going to the State. The land where the Blackfriars foundation stood was granted to the Corporation; parts of the Friary were demolished, while others became part of Christ's Hospital. The Hospital was, in fact, an amalgamation of foundations, including the first buildings of what went on to become Ipswich Grammar School. There was also a prison, an orphanage and Tooley's almshouses (which still survive in rebuilt form today). Part of the Hospital was basically a workhouse, with dormitories and a workshop. William Smart left endowments to provide for the needs of the deserving poor. The chancel of the Blackfriars church became the chapel of the Hospital, although there must have been some conflict, because the Parish of St Clement adminstered the buildings. It's not surprising, then, that during the 17th century the chapel fell into disuse, and most of it was demolished to provide building stone for the rest of the site. As buildings crumbled, they were replaced with new ones, and soon nothing remained above ground of the Friary, except for a row of four blank arcades, part of the interior wall of the Chapter House. In the 19th century, the area became an industrial one, with a brewery and factories replacing some of the foundations. For 150 years, only the mysterious arches on the edge of the brewery yard in School Street suggested to anyone that anything remotely spiritual had ever happened here. A huge slum area began to spread north and east of the area, along Cox Lane and Rope Walk. The large Catholic church of St Pancras was built in Tacket Street, on the edge of the site; thus, the Church returned triumphantly to the place from which it had been banished. We stand at the east end of the south aisle, some chantry priest celebrating Mass behind us, no doubt. Jimmy walks along the west front, the great west doorway about 10 feet in front of him. Here, Jimmy climbs the western wall of the south chancel chapel. The other side of the wall is the chapter house. He probably shouldn't be doing this. Note the surviving facing stone, once below ground. As the economy of Ipswich changed, some of the factories fell into disuse, and some were demolished. The area was earmarked as the route of an urban motorway, an act of destruction which was only prevented one night in 1970, when local people linked arms to face the bulldozers at the east end of what is now Cromwell Square, part of the route of the road. And then, in the 1980s, the demand for carparking and low-cost rented accomodation in central Ipswich persuaded the Borough Council to develop the area to the south of Tacket Street. The scheme combined award-winning flats with a privately managed multi-storey car park. As part of the development, the site of the Blackfriars church was excavated, and at a layer several feet below the modern townscape, substantial and remarkable remains were discovered. These have now been properly exposed and preserved, an astonishing document of a major, urban church. In a town beaten for medieval survivals only by Norwich, Bristol and York, we have here the remains of Ipswich's biggest church, almost 150 feet long. Basically, there is a complete outline of the church, the flint rubble wall surviving at a low level, although virtually all the facing stone has been removed for use elsewhere. The bases of the pillars of the arcades survive, as does all of the south aisle. A superstructure of a stone altar survives to the south of where the chancel; this is one of only three such survivals in the county, the others being at Orford Castle and Bury Abbey. Most interesting of all, perhaps, are the two resonance chambers that survive beneath where the choir was. They would have been filled with acoustic jars, to make the singing more resonant. Something similar survives at Southwold, and the one at St Peter Mancroft, Norwich, still has the jars in it. Standing in the chapter house, looking at the south aisle of the nave. Martha attempts elementary repairs. To the south of the choir is the chapter house, and beyond that the sacristy. The explanatory plan puts these the other way round, but I do not think that can be right. That chapter house wall in detail. The thing, I suppose, that is most dramatic about the ruins is their wholly urban setting. Blackfriars churches have survived more or less complete in other towns, including Norwich. They have grown with the townscape; but in Puritan Ipswich, that would never have been allowed to happen. The remains of the Blackfriars church of St Mary, Ipswich, are in the town centre to the south of Tacket Street, between Foundation Street and Lower Orwell Street. They are permanently open.